The Word does not belong to the preacher; the preacher belongs to the Word. This was true of Saint Alphonsus Liguori, it was true of Saint Peter Julian Eymard, and it is true of today’s saint, the holy parish priest Jean-Marie Vianney. 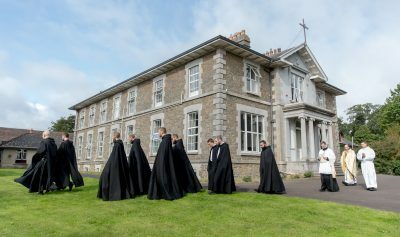 The Curé of Ars stands in a long line of preachers possessed by the Word, and compelled to speak it without compromise. The Lord said to Jeremiah, “Behold, I am making my words in your mouth a fire, and this people wood, and the fire shall devour them” (Jer 6:14). Holy preaching is, necessarily, incendiary. Jean-Marie Vianney was not particularly eloquent; he preached in a cracked and broken voice, but his words communicated the fire of the Holy Spirit. 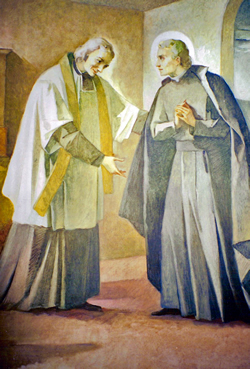 Even the greatest preacher of the nineteenth century, the Dominican Père Lacordaire, fell silent before the charism of holy preaching in Jean Marie Vianney. This is the constitutional flag of the Kingdom of Naples and of the Two Sicilies. King Ferdinando II delle Due Sicilie was a visitor to the Onoratelli ancestral palace in Sepicciano, Campania. The bed he slept in is still used! I’ve slept in it! The first week of August is one of my favourite weeks in the sanctoral cycle: Saint Alphonus Maria Liguori on the 1st, Saint Peter Julian Eymard on the 2nd, and Saint Jean-Marie Vianney on the 4th. Unfortunately, I found myself over my head in all sorts of obligations that kept me from posting this week. The most pleasant of these was the visit from Italy of my young (20 something) cousins Ettore and Sissi de Lellis, together with their friends Francesca and Gianmarco. They were overnight guests in my parents’ home. The four of them were going on to New York City from here, and from there to Florida and Mexico! Ettore, an engineer specializing in spacecraft (the proverbial rocket scientist) works in Capua. Sissi, a very pretty young attorney practising criminal law, works in Rome. Home, for both of them is the Onoratelli ancestral palace in Sepicciano, beautifully restored by their parents Carlo and Nora. This is the house where my great-grandmother (Donna Emma Onoratelli Barbato) grew up and where my grandfather (Angelo Barbato) stayed as a very little boy. Gianmarco, from Piedimonte Matese, is an attorney specializing in labour law. Francesca, a communications specialist, is from Napoli and Sorrento. Meridional sunshine! On Wednesday afternoon my mother prepared a stupendous pranzo for them: antipasto followed by ravioli, then delicious cotolette (Mom’s specialty), followed by fruit, and later on in the evening by coffee and dolci. The guests had worked up an appetite by touring New Haven’s Yale University (two art galleries!) and other local attractions. The life of the party was 94 year old Zia Edvige (my mother’s Aunt Eva) who regaled the young people with her stories in a mixture of Italian, English, and Neapolitan dialect. Great fun! At about 7:00 p.m. others began to join us: my sister Donna with husband Wayne and children Sean and Lauren; cousin Ernest Delgiudice; cousins Felicia and Jackie Campagnuolo. The conversation was a very animated mixture of Italian and English all evening. The next morning I drove our travelers to Union Station in New Haven whence they departed for New York. Now that things have calmed down somewhat, I hope to resume my customary posts. Having Ettore, Sissi, Gianmarco, and Francesca here was wonderful!